Lord Scabcoat, alias â€œThe Ratâ€, deeply annoyed that he was not taken into consideration to succeed to Lord Baldurâ€™s estate, had hatched a nasty plan: He had kidnapped Sir Greybeard, Lord Baldurâ€™s testamentary heir with the intention to extort a certain amount of ale from Greybeardâ€™s relatives. And he had also delivered an ultimatum of 80 days by announcing that he would stab out Sir Greybeardâ€™s eyes if his demand was not fulfilled within the defined space of time. Secondly, he was threatening that he would kill Lady Catherine, Sir Greybeardâ€™s daughter, if she refused to get married to him. Since then the beautiful, noble Lady wasnâ€™t secure anymore, so she decided to confide in Sir Longarm and to seek refuge under his roof ... at least for a while. 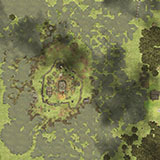 Now itâ€™s high time to fortify your keep in this godforsaken spot of land, as wolves and the Ratâ€™s gang are chasing after you. Tear down the ruins of a former church to receive stone for the construction of barracks and an armoury. This enables the recruition of archers to your protection. There are only eight peasants available, thus charge them wisely with different tasks. The swampy and misty area is an extremely unhealthy terrain, so you have to fight against fever, plagues and mordant fume. You will need a healer as well. Food is always in short supply, neither fruits nor bread, just a few domesticated wild boars for your nutrition. You can exploit pitch, a very useful insulating material for your buildings or even the wooden walls. 1 after the black pest the green circle stay bloqued at 90 %.. I think it cames from the game because i never got this troubel with stronghold 2 ..
Hmmm, sounds really weird, I have never had such troubles like that !? I really like the terrain in particular on this map. It all looks very natural and creates a nice atmosphere. Would there be any chance of a freebuild version of this map? Thanks for uploading and well done!